Forensic Union's public speaking tournament hosted at KO this weekend was an overwhelming success! The following schools participated in the event: Roxbury Latin, Choate, St. Sebastian's, Northfield Mount Hermon, and Stoneleigh Burnham. The Wyvern team worked hard and gave spirited performances. 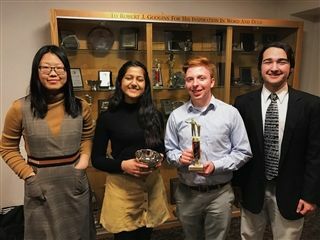 Our tireless Forensic Union officers are also to be commended for their hard work organizing the tournament, especially our seniors Dan Carroll ’19, Thomas Betts ’19, Elise Gendrich ’19, Katie Brough ’19, and again, Sikand, who helped prep the tournament and competed in it! All of them made sure that our tournament would run smoothly. 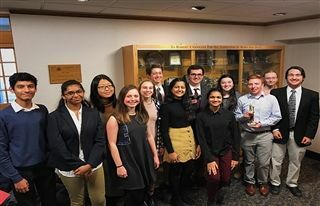 We also had a group of Forensic Union members who volunteered to orchestrate and time each round, including Geethika Chandragiri ’21, Maggie Eberle ’20, Shrinaath Narasimhan ’22, Samhita Kashyap ’22, Elsa June Ciscel ’22, and Chaitanya Karanam ’21. and Dean Bellmay, who made sure that the buildings were ready to accommodate all of our guests.